“It is a gift to be a part of an international order. You can’t be on the side of the poor only in your head. To have their firsthand experience is just such a gift and very moving,” reflects Sr. Carol Lichtenberg, SNDdeN, Provincial of the Ohio Province for the Sisters of Notre Dame de Namur. More than 175 years ago, eight Sisters of Notre Dame de Namur came to the United States from Belgium to help teach immigrant children. They brought with them their dedication to making known God’s goodness, especially among the poorest and most abandoned. Since then, the Sisters have served the poor on five continents – in classrooms, in halfway houses, in inner-city community centers, and in rural village communities. 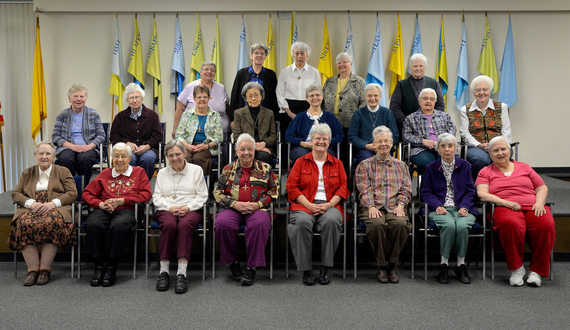 The Sisters have taught in hundreds of schools across the United States. They arrived in the Archdiocese of Baltimore in 1934 and have staffed 15 different schools, reaching thousands of students from kindergarten to college. The Sisters of Notre Dame de Namur receive no support from any diocese where the Sisters live and serve. This means they are entirely responsible for their mission and ministries, which includes caring for the frailest Sisters. Last year, the Knott Foundation awarded a grant of $100,000 to support the retirement needs of the approximately 30 elderly Sisters residing at the Villa Julie Residence in Stevenson, Maryland where the median age is 85. The residence was purchased by the Order in 1947 as a place to care for Sisters who were sick and is now used as a facility for retired Sisters before they require skilled care. For women who have dedicated their lives to serving others, it is only fitting that they receive the same love and attention in their own times of need. Today the Sisters continue to embody the virtues of their foundress and live out the charge of the Sisters of Notre Dame de Namur in their work as teachers, as ministers to the poor, and as prayerful ambassadors. They remain humble servants of the Lord who accept “the grace of the charge” with incredible passion and joy, from beginning to end.